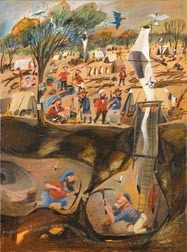 Geoff Hocking exhibits regularly in the Central Victorian goldfields region. The painting above is titled 'The New Chum Enquiring', and references a waterclour by 'the artist of the goldfields' S.T. Gill, who was recording life on the diggings during the 1851 goldrush. The title of the work has also lent its name to Geoff and Christine Hocking's 'boutique' publishing imprint NEW CHUM PRESS. Geoff Hocking grew up on the Bendigo goldfields where he lived in, aptly-named, Chum Street, Golden Square — in the shadow of 'the Quartz King' George Lansell's Fortuna Villa. Geoff studied art & design at the Bendigo School of Mines, later named Bendigo Technical College, and is today senior lecturer in the School of Visual Arts & Design at La Trobe University, Bendigo. His interest in the early illustrations of the goldfields, a love of collectable ephemera, old photographs and newspapers has led to the publication of many books on Australia's social history. 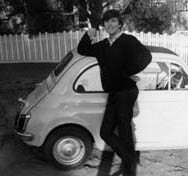 Geoff Hocking worked in the studio of World Record Club for two years from 1966 to 1967. After World Record he trained as a Technical School Art Teacher 1967. 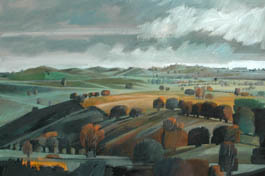 After three years teaching Art & Design at Shepparton Technical School [1968-69] and at Wangaratta Technical School  he travelled to London, where he had enrolled, and been accepted, into the painting course at the Central School Art. On arrival he discovered that he was to be considered as an International student and had to pay full-fees, and then, as the British system did not recognise his Australian qualifications as a pre-requisite to his enrolment he would not be eligible to graduate, even if he was an outrageously successful student. Dismayed but not discouraged he went in search of a job in the commercial world — Advertising. Geoff landed a job as a finished artist at Cunningham Hurst Advertising, London  and after twelve months pasting up other peoples designs he took the position of Art Director, Graphic Designer for the record company Music For Pleasure, a Paul Hamlyn subsidiary in 1972 and worked there until the end of 1973. After Music For Pleasure Geoff went freelance. Over the next couple of years he worked furiously in his Shepherd's Bush flat at book illustration, book and graphic design and work from this period was published in 'Graphis Design Annual', and 'Modern Publicity Annual' at the time. He returned to Australia in 1975, having missed the entire Whitlam era, and arrived home just after the dismissal. Jobs were not easy to come by, so Geoff continued to freelance establishing strong relationships with local publishers, and record companies. Geoff was to freelance for record companies: Image/Fable Records, EMI, Hammard, BMG and the publishers: Australian Government Printing Service, Five Mile Press, MacMillan, Thomas Nelson, Oxford University Press, Penguin, Victorian Education Department and others, and after 11 years as lecturer/senior lecturer at Swinburne Institute of Technology [now The national School of Design] he left to establish Geoff Hocking Graphics within publisher The Five Mile Press where he also acted as Art Director [1987-89]. Geoff and Christine Hocking opened the Castlemaine Bookshop in 1989. Four years later he returned to teaching taking the position of Senior Lecturer, Course Co-ordinator in the Discipline of Graphic Design, La Trobe University, Bendigo and remains in that position today, combining teaching with an active publishing program through his company images & words p/l and New Chum Press. New Chum Press has been set up to primarily publish Geoff's own 'boutique' books, and has so far published four titles: 'Early Castlemaine. A Glance at the Roaring Fifties'; 'The Red Ribbon Rebellion.The Bendigo Petition of 1853'; 'Castlemaine – From Camp To City' and 'It's Another World Record. Album Cover Art'. Album cover designs by Geoff Hocking created for Music For Pleasure [EMI] London, Hammard, Fable and Image Records, Australia.